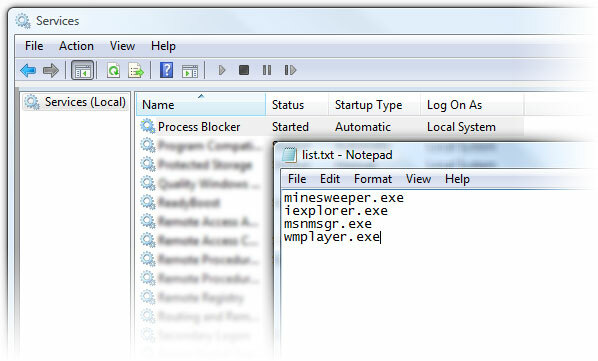 Process Blocker enables administrators to prevent running any application. Applications can be blocked by filename, full path or CRC. The hash algorithm is extremely fast, Process Blocker program is very lightweight and the user interface is simple and clear. Process Blocker supports all versions of Windows, starting from 2000 and ending with 2008 R2, and helps get rid of any unwanted application. Kills any application specified in a list made by the administrator. Click Start -> All Programs -> Process Blocker -> Configure Process Blocker. You must have administrative permissions to do this. 2.Add unwanted applications to the list. In the Process Blocker Settings window, on the Blocked Applications List tab, click the Adda?| button, type the name of an application you want to block or click the Browsea?| button to select the file. The check box allowing you to block the application using its CRC becomes available after Process Blocker finds and reads the file. Enable the check box, if necessary, and then click the Add button. Names you type are case-insensitive. You can add an application using either its full path (for example, C:\Windows\notepad.exe) or only the name of the executable file (notepad.exe). In addition, environment variables are applicable, so you can also add applications in this way: %windir%\notepad.exe. User specific variables (such as %appdata%) also work here. Qweas is providing links to Process Blocker 0.7 beta as a courtesy, and makes no representations regarding Process Blocker or any other applications or any information related thereto. Any questions, complaints or claims regarding this application Process Blocker 0.7 beta must be directed to the appropriate software vendor. You may click the publisher link of Process Blocker on the top of this page to get more details about the vendor.